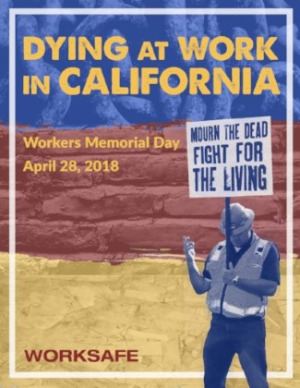 "Dying at Work in California"
"Dying at Work in California" is Worksafe's annual report, released in conjunction with Workers Memorial Day (April 28). The stories and statistics in the report are sobering reminders of the real human consequences of unabated hazards, the prioritizing of profit over safety, and the dangers workers face every day. With this report, we bear witness to the lives lost, and we look to the future by providing recommendations for improving health and safety in California. 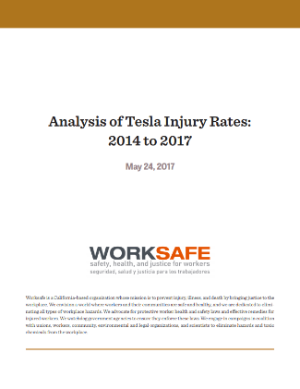 "Analysis of Tesla Injury Rates: 2014 to 2017"
Worksafe's investigation of injury and illness rates at Telsa Motors was prompted by worker concerns about potential safety hazards at the company’s flagship vehicle plant in Fremont, California. In April 2017, workers first requested copies of the OSHA Form 300, the log of work-related injuries and illnesses that companies are required by law to make available to their employees. Worksafe analyzed these logs and evaluated how their plant compared to other auto manufacturing facilities. "Improving Occupational Safety & Health (OSH) Retaliation Remedies for Workers"
In this 2015 report, Worksafe evaluates what happens when employers retaliate against workers who come forward with health and safety concerns. We advocate for a more effective retaliation enforcement system in order to improve workplace health and safety conditions for all workers in California. This 2011 report from Worksafe tallies the costs – human, financial, and social – of failures to protect workers’ health and safety on the job. We offer a range of common-sense recommendations to keep California’s workers healthy, help employers succeed, and support the communities depending on both of them.